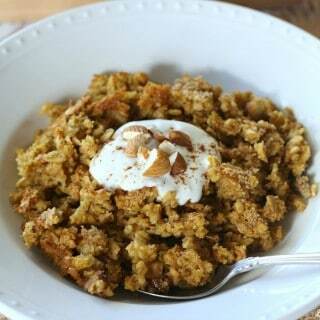 This Pumpkin Banana Bread Baked Oatmeal is warm, comforting, and filled with all the sweet flavors of fall. It’s the perfect healthy breakfast for all of those chilly mornings! In celebration of it being Friday, and also since we finally hit the first day of fall earlier this week, I have an amazingly delicious breakfast recipe for y’all today. 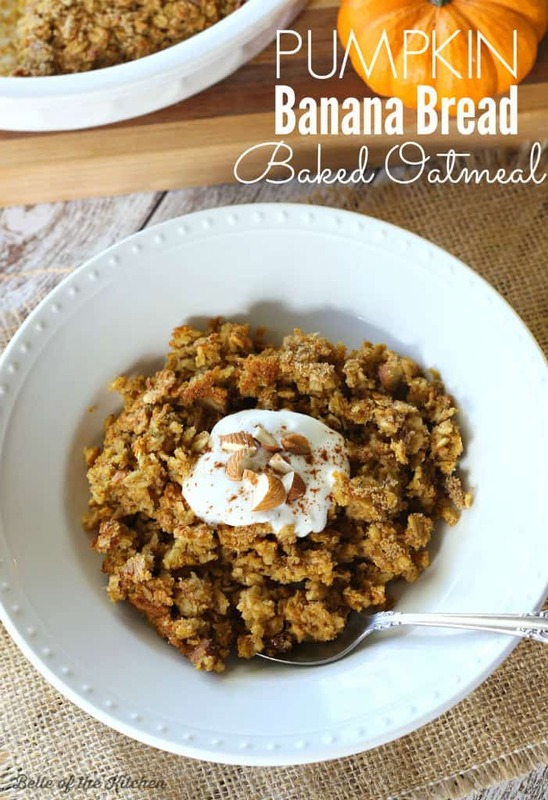 This Pumpkin Banana Bread Baked Oatmeal is my new favorite way to eat my oatmeal. Seriously, it’s just so good. It has a chewy texture with crunchy bits around the crust, which I am just crazy over! I love it so much more than the traditional mushy kind of oatmeal. In addition to tasting so yummy, this baked oatmeal also makes enough for us to have breakfast for a few days. I just refrigerate the leftovers, then warm them up in the microwave the next day. I love topping mine with a little bit of vanilla yogurt and chopped almonds. The nuts are totally optional, but they do add a nice little crunch, and help to amp up the pumpkin/banana bread flavor. Preheat oven to 350 degrees. Grease an 8x8 baking dish or round pie plate and set aside. 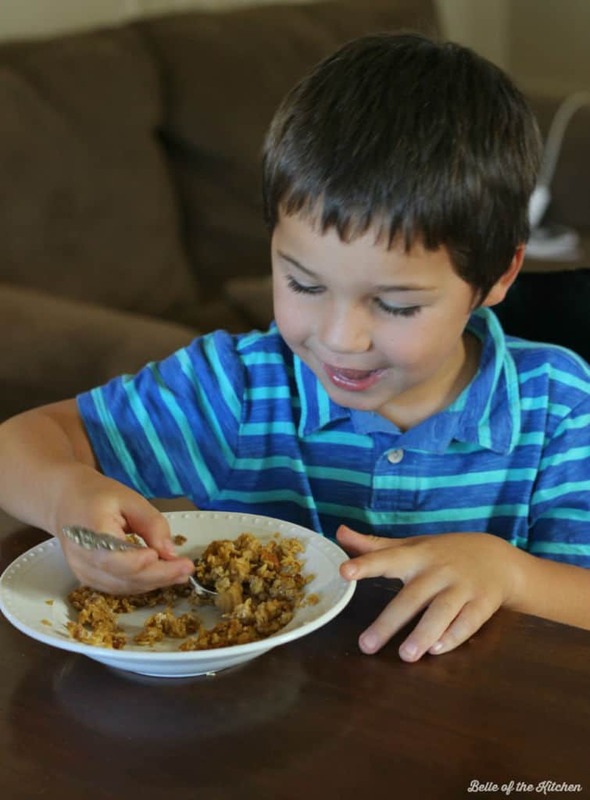 In a large bowl, combine the oats, sugar, baking powder, salt, cinnamon, and pumpkin pie spice. In a separate smaller bowl, mix together the pumpkin puree, banana, milk, vanilla, eggs, and butter. Stir the wet mix into the dry mix. Fold in the nuts. Pour mixture into prepared baking dish and spread evenly. Bake for 35-40 minutes until edges are golden brown, or a toothpick inserted in the center comes out clean. No wonder your official taste tester is chowing down, yum, this looks fabulous!! I think that it is warm and comforting too. Well done! 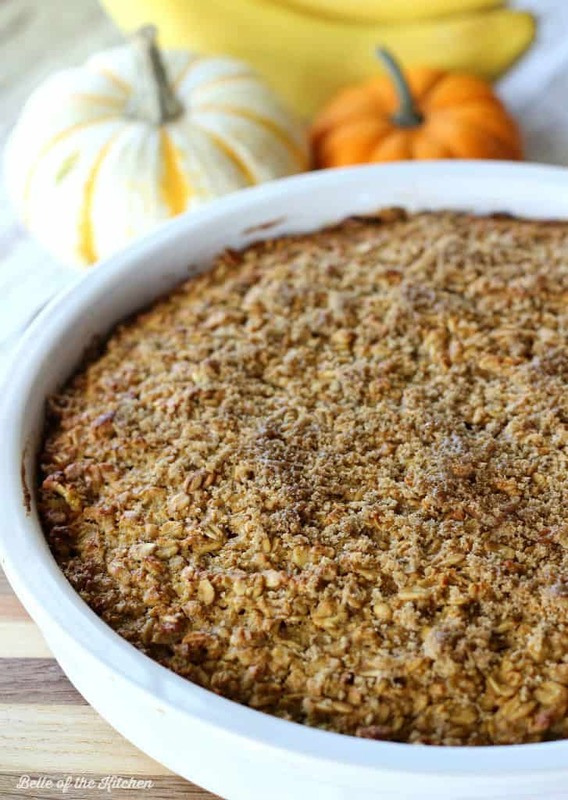 If you love pumpkin then this recipe is a keeper. Will try it soon using the same ingredients except for the brown sugar which I will replace with date syrup. Thank you for inspiring me. Wow, what a combination. I love all these things separately, so together they sound amazing. Wow, this is just the perfect breakfast for Autumn and Winter. Love all the flavours in this, can’t wait to make it. I love baked oatmeal! Looks so delicious and perfect for a healthy brunch! 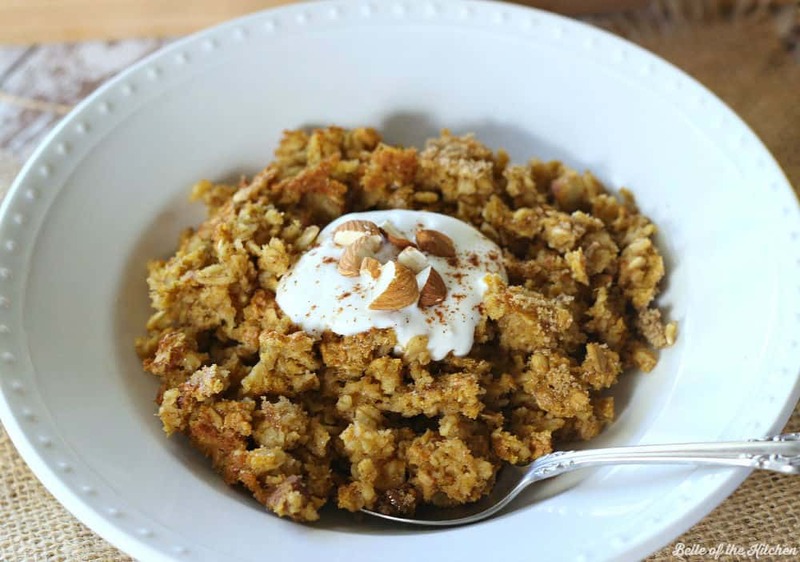 Your Pumpkin Banana Bread Baked Oatmeal will be wonderful to wake up to on a cold morning. Hope you are having a fantastic weekend and thanks so much for sharing this awesome post with Full Plate Thursday. Thank you so much, Miz Helen! We love waking up to this when it starts getting chilly outside! Wow… looks totally delicious! So happy to have discovered your blog on the Weekend re-Treat link party! Thank you so much, and I’m thrilled to have you here! I use paper cupcake liners in a dozen regular size muffin pan and divide my baked oatmeal ‘batter” into 12 servings. Decrease baking time by about 5 minutes. I’ll have a couple for breakfast and freeze the rest in a gallon ziplock baggie. I like variety, so I don’t want eat baked oatmeal for two weeks in a row. To serve, peel off paper, put in bowl, and microwave about about 1 minute with milk. Sounds like you have a good system in place, Nancy! Thanks for sharing your idea! Ohhh.. what a perfect recipe!! And your taste tester is adorable!! Great recipe, thanks for sharing this with us at the #WWDParty. Thank you, Antionette for always hosting a great party! This combines some of my favorite things for breakfast! What I meant to say was… I’ll have to give this a try. Haha. Sorry for double commenting but my computer freaked out. Happy Friday! Is this really before my eyes right now? !